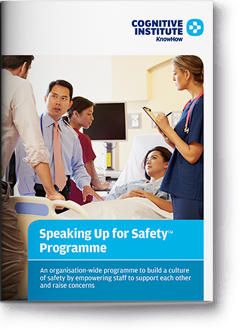 The Speaking Up for Safety™ programme helps healthcare organisations overcome entrenched behaviours that can lead to poor patient outcomes. The programme achieves culture change from within, normalising collegiate two-way communication to prevent unintended patient harm. Every member of staff from the most senior clinician to the most junior nurse will develop the skills and insights to respectfully raise issues with colleagues when they are concerned about a patient’s safety. Using a graded assertiveness communication model and common language called the Safety C.O.D.E.™, the programme increases the ease and motivation for staff to speak up and be spoken up to. This results in a culture where staff are comfortable to ‘check’ each other and welcome being ‘checked’ by others. The programme can be implemented in a single unit through to the entire organisation. The Speaking Up for Safety programme is delivered as a licensed train-the-trainer programme. This enables organisations to build the internal capability to train staff and change culture. Having the message of speaking up come from within an organisation is a powerful way to show leadership commitment to embedding a culture where speaking up is the norm. share our experience and lessons learnt from other healthcare organisations. Cognitive Institute offers a licensed Train the Trainer Programme to allow accredited in-house presenters to deliver the one hour Speaking Up for Safety presentation on an ongoing basis in your organisation. The Train the Trainer Programme training takes two days. Accreditation is achieved over four hours per group of six presenters. Your organisation determines the number of trainee presenters required in multiple groups of six (6) with maximum of 18 per session. Evaluation and accreditation – each trainee is assessed by Cognitive Institute prior to receiving accreditation to present the one hour Speaking Up for Safety presentation. Cognitive Institute is able to provide further training and accreditation services for new presenters through the agreement term should additional in-house presenters be required. The Speaking Up for Safety programme is an organisation-wide initiative suitable for all employees. For every provider of healthcare, Speaking Up for Safety is a critical aspect of achieving a safe and reliable culture. The programme teaches a common language, where clinicians support each other by effectively communicating concern to colleagues that unintended harm to patients may be about to occur. a proactive tool to enable staff to intervene before mistakes happen and unintended patient harm occurs. 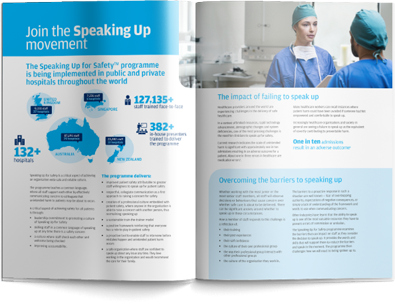 The Speaking Up for Safety programme is an organisation-wide initiative and costs vary according to the size and nature of each healthcare provider. Please contact us to find out more about the costs to implement this programme within your organisation. Increasing the ease and motivation for clinicians to raise patient safety concerns with colleagues through graded assertiveness communication skills training.